Many call St. Augustine, FL, their favorite historic city to visit, and with so many fascinating area attractions it's easy to see why. When it's time to book your next vacation or business trip, it helps to know that you're getting comfortable accommodations in a fascinating city. That's why, when you're looking for places to stay that keep you close to more area offerings, it helps to choose the lodging that puts you at the center of it all. The Ponce Hotel offers more visitors a great way to see your favorite historic Floridian city. By keeping you less than a mile from many local points of interest, including historic attractions, shopping, and dining destinations, we can offer you a great value on your hotel stay. We're located just next to the Florida East Coast Railway designed by Henry Flagler. When you book with us, you're getting great hotel deals with a variety of standard guest amenities. With a free full hot breakfast served every morning, outdoor swimming pool and Jacuzzi, and free on-site parking, you'll find more ways to enjoy your next visit here. In addition to the added convenience of placing you closer to more popular landmarks, we also offer room accommodations for every need. Whether you're looking for a great deal on a standard double beds room, more spacious king bed, or an upgraded suite, we can find the best room size for every need you may have. Just because our city is historic doesn't mean your hotel rooms have to be. 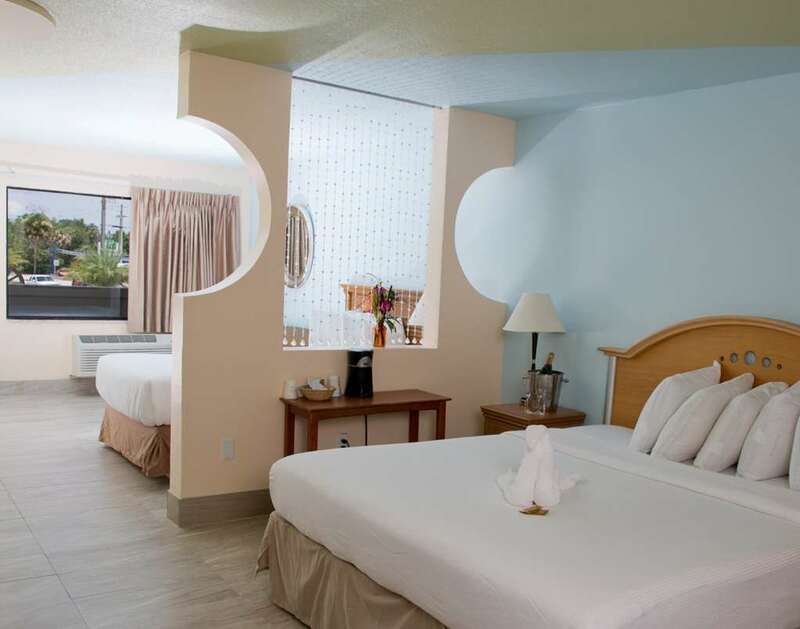 You'll find our hotel comfortable, spacious, and designed with a contemporary style. Each room is well lit and spacious, giving you and your traveling party a comfortable night's rest each evening. For the best hotel say that will keep you closer to everything our city has to offer, it's hard to beat the value that you can enjoy by booking with us. It took the genius of Man to look at a towering redwood tree and see the potential for a wooden Winnebago. < 1 mile from Saint Augustine. An animatronic Blackbeard head, several torture exhibits, a real treasure chest and Jolly Roger flag, and other memorable exhibits. ~65 miles from Saint Augustine. Florida's first tourist attraction opened in 1878. No longer a private business; became a more nature-oriented state park in 2013. You can still look through the bottom of your glass-bottom tour boat and see the fish.